Here is the easiest way to shop for the motorcycle enthusiast on your holiday gift list. These gift certificates can be purchased in $25.00 increments to $2500.00. and 51 and above units are $22.50 each saving 10% off parts and accessories on future purchases. Example 60 unit gift certificate value is $1500.00, and is Holiday priced at $1350.00. 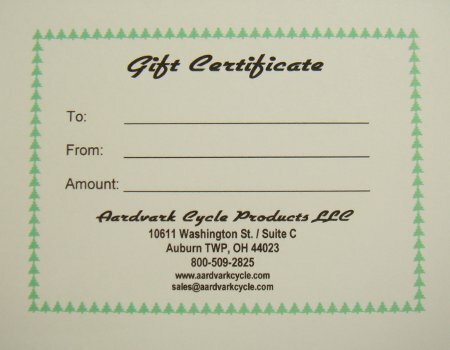 Happy Holidays from all of us at Aardvark Cycle.